The Millennial Medical In-Motion Forearm Crutches have the most innovative design available. 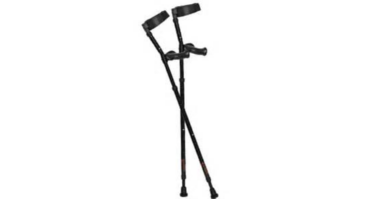 These ergonomically designed crutches have a handle that offer a natural grip, where the third metacarpal bone aligns with the radius bone of the arm. The handle is angled at approximately 24°, reducing stress to joints and muscles. With a fully molded cuff design there are not any irritating rivet heads or external hinges. The "V-design" allows for easy entry and comfortable hands-free use. The strut is made from aircraft grade aluminum that can support users up to 400lbs. These crutches are made to last. Wear the shoes you will most commonly wear during crutch use. Using this measurement, look at the range of handle heights in the short and tall forearm crutches listed. Wherever your measurement falls is the crutch size you should use.